If you're not marketing your heat printing t-shirt business, you're missing sales. As a small business owner you've got a lot to get done and not a lot of time to do it. You're not necessarily a marketer but marketing is an essential element of any strong business. Thankfully marketing doesn't have to be complicated to be effective. 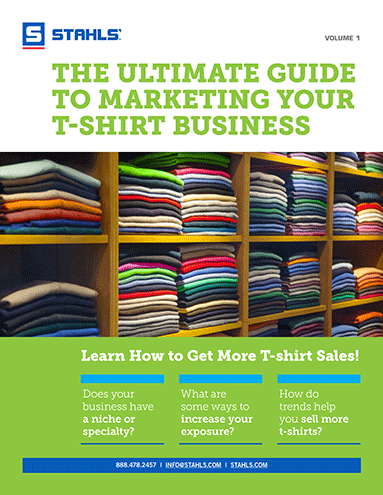 This 28 page book is full of simple tips, actionable techniques, worksheets, and templates to help you effectively market your T-shirt business and make more sales. Learn how to market a T-shirt business. Use your competition to make your business better. Build loyalty and repeat business with a customer database. Use trends to keep your business on top. Cross-sell and up-sell to uncover new opportunities. Implement a marketing plan in just 10 minutes a day. If you're already a Stahls' customer, log in to download.